Last year, I wrote a blog on how to get CouchDB Runtime Statistics and saving it as a json file. However, want I really wanted was to save and open the file in excel. Therefore, I wrote a Groovy script to read Runtime Statistics data from json file and save all the Key values into an excel file. Below is the prerequisite to execute the script as well as the script. 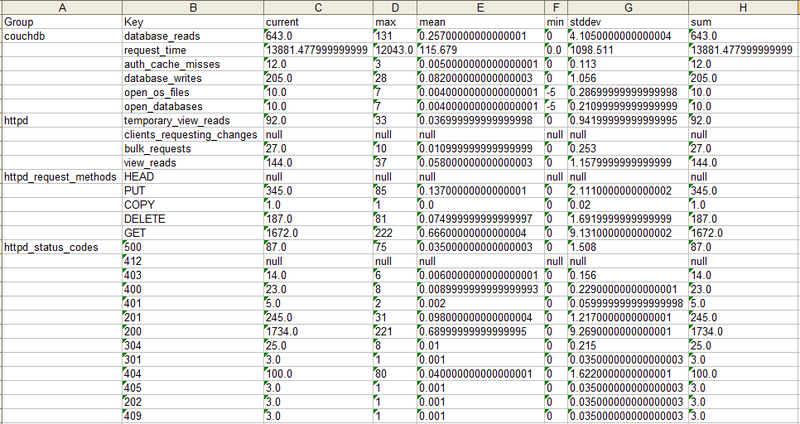 NOTE: Their already exists a python script to capture the CouchDB runtime statistics. Download and Install Groovy Console application. Download and copy jxl.jar file into the Groovy lib folder. Check couchDB excel file exists. If it does not, create it and add all the necessary headers to a worksheet and close the file. Read and parse the json file. Open the couchDB file for writing. Navigate through the parsed json data and save all the Group names. Navigate through each group name in step 4 and save all the Keys associated to it. 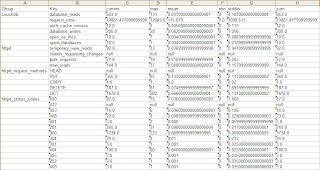 For each Keys saved in step 5, navigate through it and save all the associated values into excel file. Once done, close the worksheet.